In spite of her privileged position in Boston society, Ann was unable to stave off strong public sentiments against her. Following her influential husband’s death, she was considered “so odious to her neighbors as to cause some of them to accuse her of witchcraft.” When the accusations mounted, Ann was brought before the authorities, who concluded that she should stand trial. Regrettably, no court records or firsthand accounts remain to tell us of the evidence presented against her or the names of witnesses who testified on her witchcraft activities. 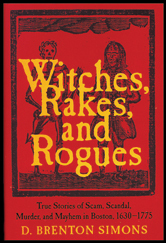 One of the final references to the possibility of witchcraft in Boston came in 1694. After making a mundane entry in his diary on January 19, 1694, about the installation of a new kitchen floor, Samuel Sewall noted the following tantalizing item: “This day Mrs. Prout dies after sore conflicts of mind, not without suspicion of witchcraft.” Elizabeth Upsall Greenough Prout would have been one of the last women in Boston to be considered a witchcraft victim, but the episode at the close of her life remains an unsolved mystery of early Boston history. Unlike the more famous events in Salem in 1692, episodes of suspected witchcraft or diabolical possession in Boston were mostly unrelated events. Many women and a few men escaped with their lives. Women and children who experienced what they claimed were possessions gradually returned to normality. However, for four Boston-area women – Margaret Jones, Alice Lake, and Ann Hibbins, as we have seen, as well as Mary Glover – witchcraft charges leveled by their neighbors exacted the ultimate toll.